A few years ago, I came across a post on Apartment Therapy called How to Clean Your House in 20 Minutes a Day for 30 Days. Longest title in the world, but I was still intrigued. After reading through their suggestions, I decided to try it out. The first thing that you do is make a list of everything that needs doing in your house. In the post, Apartment Therapy gave a list of some things that will help you start, like vacuum living room, clean bathrooms, and dust, but you can add anything else that you need to to keep your house or apartment clean. If you are stuck for things that need to be done, walking from room to room and opening all doors, cupboards, and closets will definitely help in giving you some ideas of what needs cleaning or organizing. The next step is one that I took on my own, which is to assign a few of those tasks to every day using a calendar. 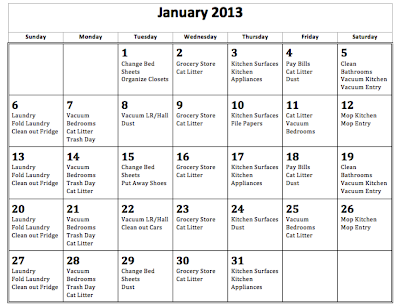 I created a calendar in Microsoft Word and you can actually download the template here. Choose a few tasks and add them to different days on the calendar, but make sure that with the exception of one day per week, the total time it woud take to complete those tasks won't exceed 20-30 minutes a day. Having your daily cleaning tasks done quickly means that you have a higher likelihood of completing them, since you know that they won't take up hours of your time. Also, feel free to give yourself a day or two off a week, so you have time to do some other things. You can tell from the example that I put above that things tend to repeat themselves over a two week period, but that there are some other things that end up being monthly instead of weekly or bi-weekly. Other tasks are done on specific days intentionally, like cleaning out the fridge for example. Since my trash day is on Mondays, cleaning out the fridge on a Sunday makes sure that week-old food gets into the garbage before it goes out that week. Once you have your calendar set, you can print it out and hang it up, or you can just reference it from your computer, tablet, or even smartphone and save some paper. Once you start paying attention to it everyday, it will start to become routine, and you won't even need to reference your calendars because you'll know what you have assigned to each day. 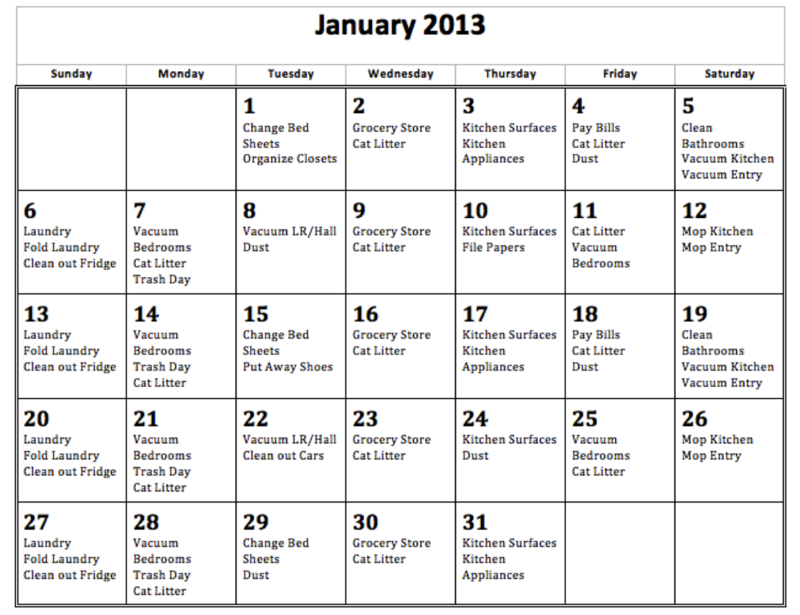 Do you use a cleaning calendar? How has it changed your home's appearance? Do you keep things neater now? Are your Saturday's or Sunday's finally free from a day's worth of cleaning?